This dramatic scenic view is know world-wide. The view overlooking the Valley of the Tweed and the three peaks of Eildon Hill from Bemersyde was one of poet Sir Walter Scott’s favourite views of the Borderland. The viewpoint can be located travelling north from the village of St.Boswells up the sloop of Bemersyde Hill, three miles east of Melrose. 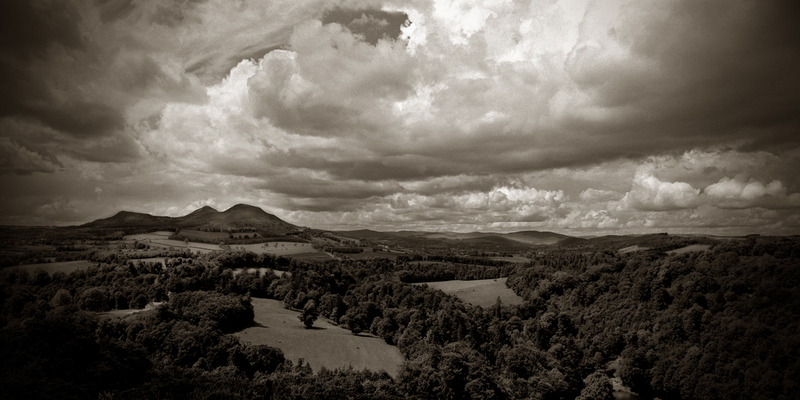 The Eildon hills are remains of volcanic activity. In the past they have been occupied by Iron Age people and Romans. The flat area of land within the loop of the river Tweed is the site of the first Melrose Abbey. Nothing now remains at Old Melrose. It is said that the horse taking Scott to his enterment at Dryburgh Abbey stopped at this spot, as it usually did on its daily outings with Sir Walter aboard to allow their master a last look at his beloved Borderland landscape.